The fine fruit distillery Gebr. J. & M. Ziegler was founded in 1865 in Freudenberg am Main and since then represents the art of distillation in its finest form. 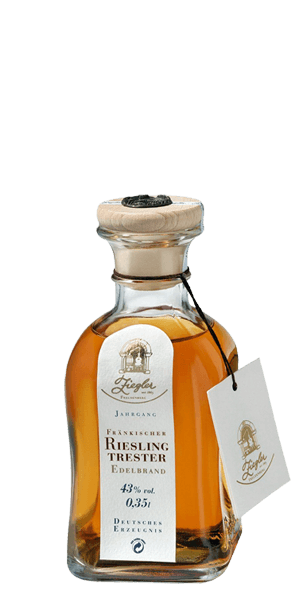 It is one of the most renowned distilleries in Germany today. The director Alain Langlois and master distiller Jürgen Marré are committed to the tradition of the company and devote all of their attention to find only the best of grapes from the local vineyards. The Ziegler Riesling Tresterbrand 1989 is made from Riesling Pomace from Franconia, Germany. The Riesling was born in the valley of Rhine and has a rich history with German people because it was and still is a part of their culture. It is a white wine grape variety known for its aroma and high acidity. This Pomace Brandy is special because it has been aged in oak and chestnut casks for a whopping 20 years. The casks have formerly been used to age vintage apple Brandy so the final product makes us want to stop typing an…. What does Ziegler Riesling Tresterbrand 1989 taste like? The Flavor Spiral™ shows the most common flavors that you'll taste in Ziegler Riesling Tresterbrand 1989 and gives you a chance to have a taste of it before actually tasting it. Fruity and flowery with a distinctive freshness. Highly aromatic with a vinous depth and expressions of plum and raisins, the rancio is present. A smooth, fruity, long and elegant finish that stays.